Chicago is your Innovation Destination! Swissôtel Chicago, designed by renowned Chicago architect Harry Weese, is an award winning, four-diamond, all-glass triangular luxury hotel. 323 E Upper Wacker Dr, Chicago, IL 60601 – U.S.A.
PDMA has secured a special room rate of $199/night plus state and local taxes (currently 17.4%) for single/double has been extended to October 19, 2018 or until the room block is exhausted, whichever comes first. In the heart of downtown Chicago where the Chicago River meets Lake Michigan, Swissôtel Chicago offers a unique alternative to conventional hotels. 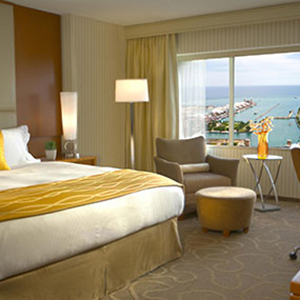 Enjoy first-class luxury and Swiss hospitality in stylishly modern guest rooms and suites that surpass all expectations, with stunning views stretching along the lakefront from Navy Pier to Millennium Park. Luxury accommodation is just steps from the lakefront, the downtown business district and fabulous shopping on The Magnificent Mile. Admirers of the arts will find bliss at the Art Institute of Chicago. Stay Active: Take your workout to a new level in the Penthouse Fitness Centre, with panoramic views from the 43rd-floor or with our daily Vitality activities. Both airports offer plentiful taxi service downtown. Rates range from $40-50 from O'Hare, and $30-40 from Midway. Rates vary based on travel time and are subject to change. The Chicago Transit Authority serves both airports for easy and economical travel downtown using the 'L' train. The 24-hour CTA Blue Line connects directly to O'Hare and the CTA Orange Line connects directly to Midway. Read more on getting around Chicago with public transportation or visit transitchicago.com/airports for full fare information and maps. GO Airport Express provides shared ride services to all downtown hotels and many businesses. Pair fares and group discounts are available along with customized reservation portals for your groups. Additional directions can be found on the hotel transportation website. For all international participants, please visit the U.S. Customs and Border Protection website for important information on entry. Welcome to Chicago! While you're in Chicago, why not check out world-class museums, dine at one of many Michelin-star restaurants or catch a show in one of over 200 theaters? There are plenty of city attractions, including tours, spectator sports, and other attractions. If you prefer the nightlife, you'll enjoy plenty of bar and nightclubs options, live music and comedy clubs. Find more at choosechicago.com.